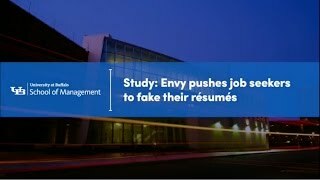 BUFFALO, N.Y. — Job seekers who stay in the search longer or see their peers getting hired may falsify their résumés, according to a study from the University at Buffalo School of Management. Published online in 2015 and recently published in print in the Academy of Management Journal, the study analyzed how the length of a job search and a person’s career situation may lead to unethical behavior. The researchers conducted two studies to measure job search envy at two different career points. The first study analyzed survey responses from 335 unemployed job seekers from an internet job board serving the Southeastern United States. The second study tracked a cohort of 77 graduate students enrolled in a master’s of human resources program at a large U.S. university. The researchers surveyed participants over the course of two years, tracking job search envy during both internship and job searches. Lee says that hiring managers and career counselors should take note of job seekers’ situation to help identify and prevent résumé fraud. Lee collaborated on the project with Brian Dineen, associate professor of management, Purdue University Krannert School of Management; Michelle Duffy, Board of Overseers Professor of Work and Organizations, University of Minnesota Carlson School of Management; and Christine Henle, associate professor of management, Colorado State University College of Business.